Grays Harbor is in Washington State along the Pacific coastline, approximately at the halfway point between the Oregon and Canadian borders. The Port of Grays Harbor is important for exports of soy, seafood, lumber, and other goods. 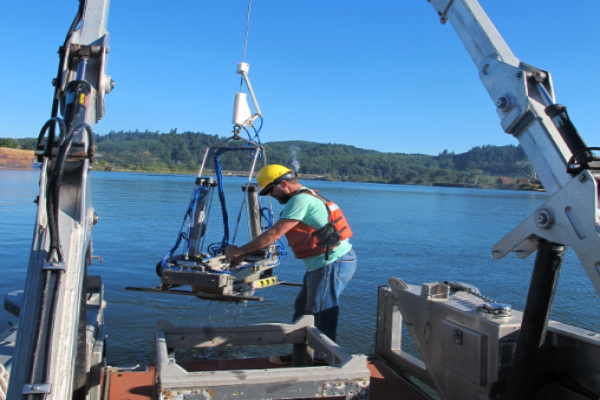 ANAMAR teamed with EcoAnalysts in Port Gamble, WA, to provide dredge material evaluation of the entire Grays Harbor channel, from just offshore through Aberdeen, WA, or just over 20 miles of length. The estimated dredge material volume exceeded 4 million cubic yards. Sediment samples were collected from more than 250 locations and were composited into 40 samples that were then sent to laboratories for chemical and physical analysis. The samples were maintained at appropriate temperatures throughout the sample collection and shipping processes. Once testing was completed, the results were evaluated, compiled into summary tables for initial review, and reported to USACE Seattle. ANAMAR also prepared a file for upload into the Washington State Environmental Information Management System (EIM) database. All chemistry and physical results were acceptable and toxicological analyses were not required. Collected all sediment samples while adhering to protocols that ensure sample integrity. Submitted a sediment testing report meeting all necessary objectives. Submitted an electronic data deliverable for upload to the Washington State EIM database.